The apparatus is deemed to comply with the requirements, if the insulation resistance measured after 1 minute is not less than the valves given in table 5 and no flash-over or breakdown occurs during the dielectric strength test. When testing enclosures of insulating material, a metal foil is pressed tightly against accessible parts. The Hot Winding Ohmmeter measures AC winding temperatures during AC operation. It can be used for AC motors, transformers and other AC coils. 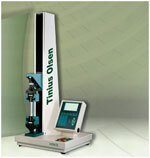 This instrument uses the resistance method, measuring during operation. This equipment gives data logging of the test results. It is available with 1 to 3 measurement channels. The Hot Winding Ohmmeter makes it possible to measure temperatures continuously during operation. The temperature time curve can be recorded, giving an early indication that temperatures are becoming too high or the temperature is stabilizing (which shortens the test). This new design of pink noise generator meets the requirements from the latest standard requirements for pink noise in IEC 60 065/2001. IEC standard 61032 is the MAIN STANDARD for most of test fingers and test probes. This standard shows the collection of probes. The appliance standards refer to this standard and there you can also find tolerances of the fingers and probes. The Abrasion Test for Plugs is an endurance test of plug pins sleeves according to IEC standard 60884-1 Clause 24.7 figure 28. 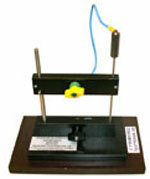 The Abrasion Tester is a small box with a motor holding sharp edge probe with weight scratching the surface.